I have never had any success with Calvin Klein’s fragrances; I tolerate some, dislike many and hate two of them with undying passion. His new scent, Euphoria, falls into a tolerated category; it is perhaps the most likable (or the least disagreeable) of all his perfumes. Euphoria has notes of pomegranate, persimmon, “lush green accord” (insert eye-roll here), “dewy lotus blossom” (more eye-rolling), champaca flower, black orchid, amber, black violet, “cream accord” (yeah, yeah) and mahogany wood. My main complaint is that Euphoria is too sweet. It is not quite as toothachingly candy-sweet as Antica Farmacista’s Melograno, another pomegranate scent, but it is quite overwhelmingly sweet nevertheless. A ripe pomegranate is a sweet fruit, but to me pomegranates are characterized by their wonderful astringency, which balances the sweetness; that quality is sadly lacking in Euphoria. The scent does not have much development on my skin; all notes appear at once and stay together. The most interesting of them are unfortunately not really evident to my nose, for example I am completely missing the promised mahogany wood, or “black” violet, or champaca, or even amber. Euphoria is all fruit and nothing but the fruit, vaguely recognizable as pomegranate; the middle stage and especially the drydown are haunted by the ghost of Angel. Euphoria could easily have been yet another variation of Angel, perhaps called Angel Fruitee or something along those lines; the two are definitely quite closely related. Euphoria is certainly not the worst of the recent fragrant designer offerings; if you are looking for a warm, rich, sweet scent, you might really like Euphoria. If you are on a market for a pomegranate fragrance, may I recommend you try Jo Malone’s Pomegranate Noir. It is not a very true pomegranate fragrance either, but it does have in abundance that mouthwatering astringency that I personally adore in pomegranates and is in general immeasurably more beautiful, deep, and interesting than Euphoria. Euphoria is available pretty much everywhere and retails for $40.00 to $65.00. 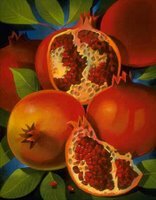 *The painting is Pomegranates by Johnny Karwan. Thank you for your euphoria post. I sure agree, would even go beyond. Euphoria is visiting a research department of a juice factory where laborious chemists try getting rid of any acid aspects of various juices. In the background of the lab a technician is doing experiments with Vanilla, tons of it. Somewhere close by is a wood factory, where people experiment hard to turn average saw dust into mahagoni. I was very disappointed by euphoria, but have to admit: Nice flacon & colour settings. I was laughing reading your comment...but at least you get mahagoni dust, I haven't got even that, just fruits and syrop. I do like the color of the bottle and the packaging though. Doesn't sound overly impressive or overly obnoxious.I'll try this when it becomes a regular on the discount e-tailers.The color combo and shape of bottle are unique.That's always a plus isn't it! Have you tried the SMN Melograno? My memory is that it is tooth-ache sweet too, but my powers of recall leave much to be desired. I am saving my pennies for Attrape-Coeur and Cuir Beluga. R, I thought you woul;dn't likey either. I haven't tried SMN Melograno yet but if you say it is too sweet, I am not going to. Have you tried iPdF Melograno Selvatico? It is a lighter, green-ish pomegranate that to me was more leaves than fruit and I thought you might find it somewhat to your liking. M, the iPF does seem like something I would like, and I did think it was pretty, but no more than that. There are many others from iPF that I far prefer. There are at least two of us, mutants, K. Fruit and only fruit, that was my conclusion two. I am especially annoyed that I didn't get any mahogany. Boo. I definitely can smell more than fruit. I must be one of the few who can smell the amber and wood, but admittedly, they only come out as an under scent. I rather like the smell of this scent. Just had another smell of this and er... nope, i'm not getting fruit. I get quite a dark, intense, warm but woody smell; definitely not light or fruity but then I have been wearing it for a few weeks now. On first sniff, I thought it cloyingly sweet and sickly but was drawn to something 'underneath'. This may sound bizarre but there is something in it that is vaguely reminiscent of Lancome's Magie Noir (which I also love but don't wear cos its toooo heavy/dark). I like it very much (as does my b/f). Clearly, its definitely a question of skin type... (Great site btw). I like it very much. I'm not crazy about the bottle though - I think that the bottle makes it look much more flowery and sweet than it is. Perfume smells different on everyones skins. I have to say I really like Euphoria! I do get the darker notes But sometimes the sweetness is a little bit to prominant at first. I have actually been asked by a friend if I was wearing mens aftershave!! But I love it and you cant make a decision unless you have tried it...on your own skin!!! I love Euphoria..it's sweet, spicy and earthy..lots of sensuality comes with the warm notes..perfume definitely is different on every skin type..so try it for yourself..i get no fruit whatsoever..lots of amber and musk..nice..i would wear year round except for hot summer days.. I feel like a honey bee when I spray I can't keep my nose away from it. If you like elegant fragrances, you will adore……..